The ultimate grilled honey bbq bacon burger. 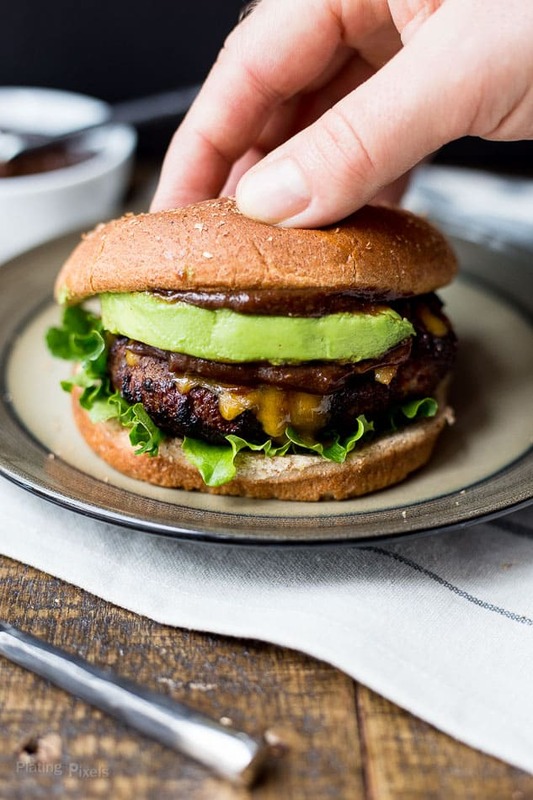 Easy juicy burger with bbq sauce, bacon, cheddar and avocado you can cook at home. 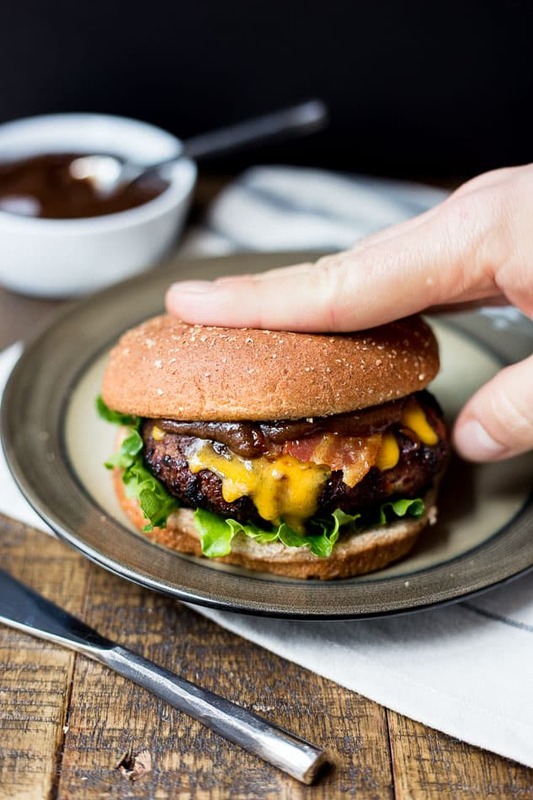 Within this recipe post you’ll make a homemade Ultimate Honey BBQ Bacon Burger. It’s so rewarding to cook a burger like this at home. Plus you’ll learn tips on how to make perfect flavorful and juicy burgers. Sunny days and fresh, warm air means summer and grilling season is in effect. Cooking on a grill has an almost therapeutic effect for me.There’s something about the smell and hand-on approach to it. Plus the charred flavor is unique only to grilled foods. It’s been a while since I’ve posted a burger recipe here and that means it’s time for an epic burger. This Ultimate Honey BBQ Bacon Burger won’t disappoint. It’s loaded with all the essentials like cheddar cheese, bacon, avocado and barbecue sauce. Plus it’s absolutely stunning on camera as well as in front of your guests. Sweet, tangy and savory are flavor pallets that will delight the senses. 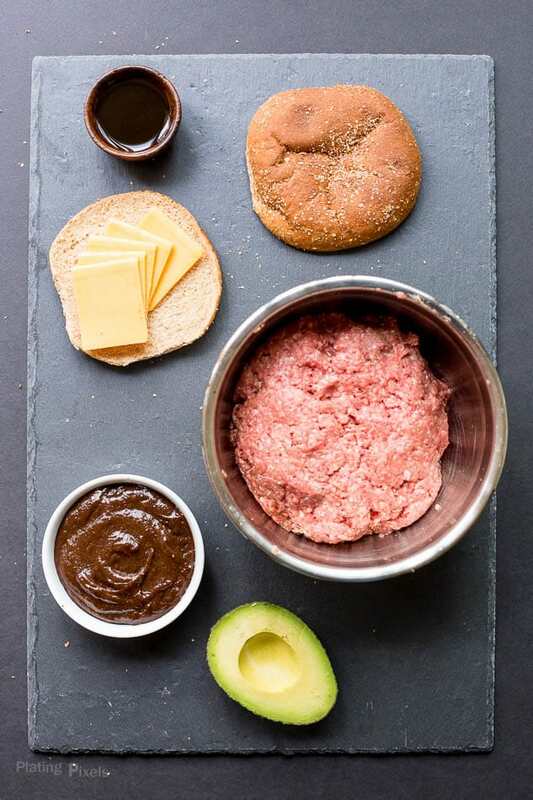 The unique pairing of ingredients all work together to create an epic burger worthy of any summer party. To add some extra fun make your own barbecue sauce as well. 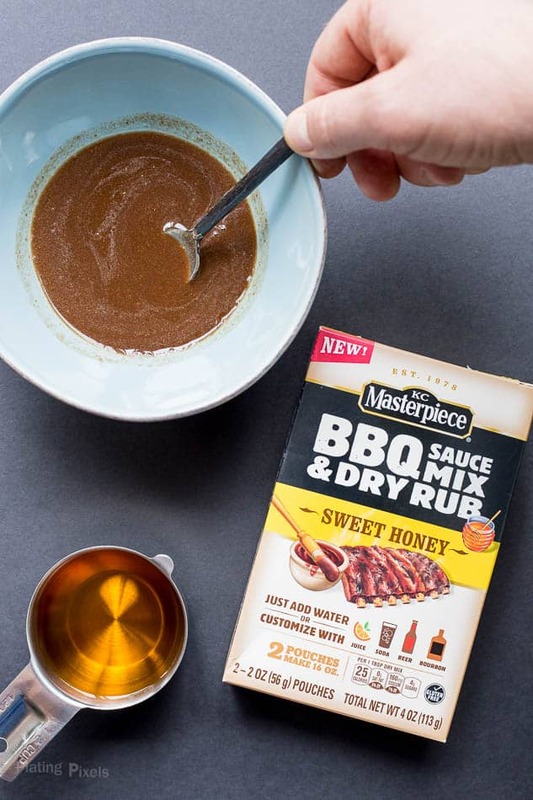 I used KC Masterpiece’s BBQ Sauce Mix & Dry Rub Sweet Honey BBQ flavor. Made from a perfect blend of rich tomato sauce, molasses and spices, use it to add authentic taste to any recipe. Mix with any liquid to create a marinade or sauce, such as bourbon, beer, soda or juice. I used beer, well because cooking with beer is awesome. Try it with different beers to change the flavor profile, for this recipe I used a wheat beer. Plus most varieties are gluten free if you prefer your burger protein style. This summer I hope you enjoy plenty of grilling with friends and family. Try these Ultimate Honey BBQ Bacon Burgers as a unique burger recipe oozing (literally) with flavor. If you follow the steps in the recipe I guarantee you’ll make a wonderfully unique and flavorful BBQ Bacon Burger. For an in-depth guide to making perfect burgers check out my Best Bacon Cheddar Stuffed Burger Recipe post. 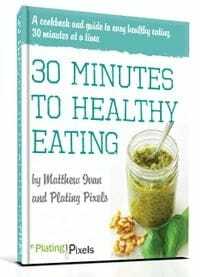 You’ll learn secrets tips as how to pick the best meat and ingredients, how to add extra flavor and how to cook burgers to juicy perfection. Flavor profiles: Meaty, savory and a bit sweet and tangy. 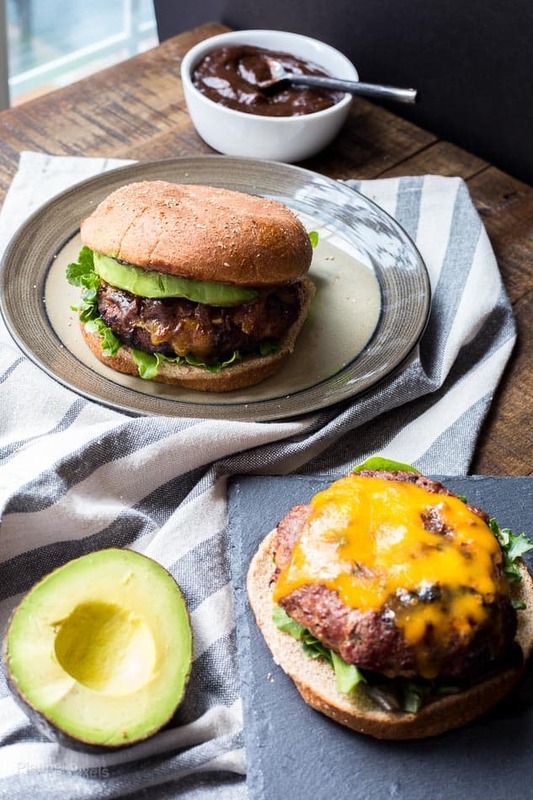 Texture: Moist, tender burger with crisp bacon and creamy avocado. Dietary options/substitutions: For gluten-free omit bun or use GF bun. 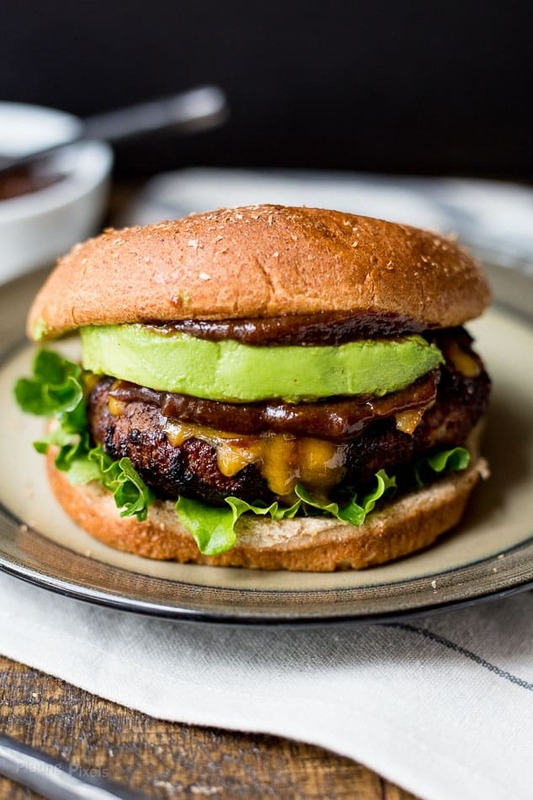 Easy juicy burger with bbq sauce, bacon, cheddar and avocado you can cook at home.